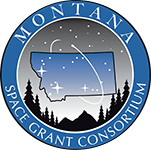 As you will see below there are many opportunities for both education enhancement and research development available from Montana Space Grant Consortium and Montana NASA EPSCoR. Education Enhancement Grants are awarded competitively within the state through internal review of proposals. Emphasis is on "product" or "value added"; we will not fund "improvements" which require continuing Consortium funding to maintain their existence. Awards are for one year, but may be renewed if further development and goals are proposed. The purpose of the faculty fellowships is to foster increased NASA-related research activity on Montana campuses, especially activity that involves undergraduate students. In this case, we mean ‘NASA-related’ broadly - encompassing most Science, Technology, Engineering or Math (STEM) fields. Proposals due February 15, 2018. Visit the Montana NASA EPSCoR page for information on opportunities.